In June 2017 Laertis-Antonios Ando Vassiliou, architect and founder/director of OPA Open Platform for Architecture (2014) and LAAV Architects (2016) has been selected as the Ambassador to be featured in films for the new Infiniti QX80 model for Infiniti Motors Limited. The role of the QX80 Ambassador included the participation in several commercial videos, which were created by the advertising agency Designory Inc. together with the production company Zuma4 Productions. The films were shot in Calgary, Canada (City Centre & Nakoda Area) in the beginning of September 2017 and some additional services for Laertis were to design an exclusive project for the selected filming location to be used for marketing purposes. The exclusive project is the minimalistic cliff cabin named “Maralah” (which in Native American means: he/she who was born during an earthquake), as a tribute to the history of the specific area as a Native American Reserve. “Maralah” project has been developed under the guidance of Laertis-Antonios Ando Vassiliou in collaboration with ADD Architects, (Argyris Chronopoulos & Dionysis Koutsioumaris). The films have been directed by the acclaimed director Ericson Core, while the whole production has been managed by the Vancouver-based Location Fixer. Maralah is an isolation cabin, the perfect escape-retreat for a weekend away from the city. An architectural tribute to the legacy of Frank Lloyd Wright and John Lautner. 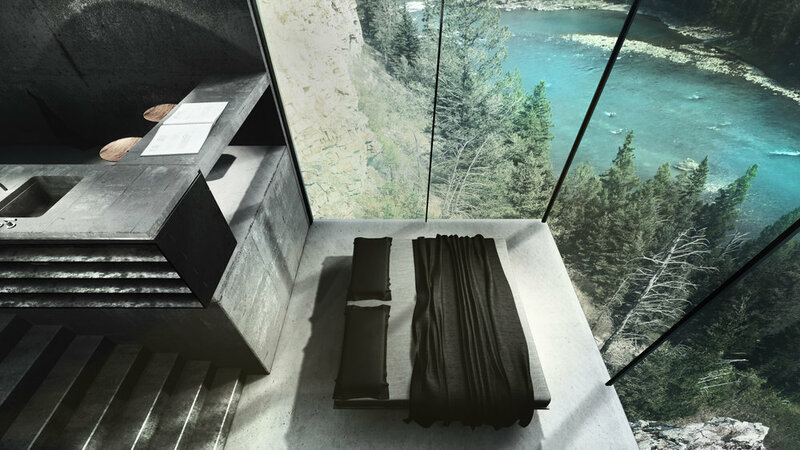 Partly submerged in the ground, partly cantilevered over the cliff with a dramatic fully glazed bedroom, framing the breathtaking view over the turquoise Bow river. The cabin is rather small, 45sqm with an extra of 20sqm as reserves for water supply, wc facilities etc. 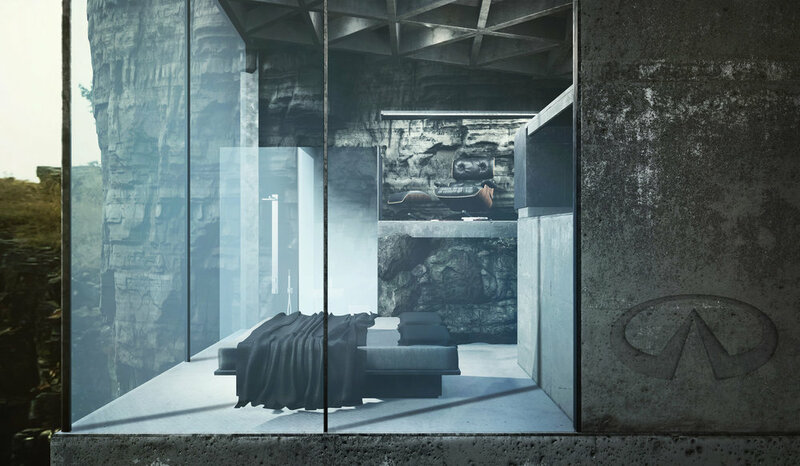 It is designed to be constructed out of raw concrete, glass and matte black steel. The bedroom is located 6 steps below the kitchen/reading area together with an opaque-glazed toilette and a shower cabin. Small storage space/closet is located under the dining bar/kitchen. The reading area is located opposite the kitchen and next to the uncovered layers of the local limestone, where an Eames lounge chair is placed, overlooking the view. The shape of Maralah is square, yet with the rotation of 45 degrees it achieves a dynamic relationship with the cliff and the ground and appears as if it has been merged out of the ground during an earthquake, just as its name describes. The slopped, partly-submerged roof is planted in order to blend-in with the environment. Laertis-Antonios Ando Vassiliou was born in 1983 to Greek & Japanese parents. He grew up in Rhodes until 2001 when he started studying architecture at the Technical University of Athens (NTUA). In 2005 he earned his first distinction at an architectural competition, which allowed him to study for six months at ISA Victor Horta in Bruxelles (2006). Since then, he has built his first commissioned design in Rhodes (2006-2008), received his MArch diploma (2008) and in 2010, completed his second project in Rhodes. The same year he left Greece to explore architecture in the Netherlands where he completed his MSc in Architecture & Urbanism at TU Delft (2010-2013), supported with a full scholarship by the Greek Scholarship Foundation (IKY). During his study he worked for Mecanoo Architecten (2012) and entered his first professional competitions, with distinctions. In 2014 he worked for UNStudio Amsterdam and by the end of the year established OPA Open Platform for Architecture with a cutting-edge portfolio including the world-renowed designs of Casa Brutale and Lux Aeterna. Since October 2016 he established his personal architectural practice, parallel to OPA, LAAV Architects to continue the legacy of Casa Brutale with Villa Clessidra, both viral, both under development or client negotiation. Laertis is a registered member of the Greek (2009) and Dutch (2013) architectural registries with offices both in Haarlem (NL) and Oxford (UK), where he recently moved. He is a passionate architect but sooner or later he dreams of becoming a novelist. He is a family-guy who loves books, cats, memes and anything with a motor and wheels.